I came home from the market the other day and I had bags of acorn squash, butternut squash, parsnips and obviously the sweet potatoes and yams you see here. When Fall hits, I immediately go into squash and root vegetable mode. It’s hard not to. But there is something about yams and sweet potatoes that float my boat. I wonder what it is…oh yeah, it’s a potato…my kryptonite. So I wanted to roast these potatoes, which I could happily eat plain, but the family would want a dipping sauce. I wanted smoke, I wanted sweet and I wanted tang. So I started playing around and came up with something we loved. It had such a good flavor. We had some the next day and it was even better. The flavors had melded together. This is going to be a staple dish through the Fall. Serve the potatoes on a platter with the sauce and enjoy the smiles. I am definitely trying this tonight, having a get-together this evening and popped on your blog to find inspiration. Glad to hear it!! Make the sauce early so flavors meld and keep in the fridge. I didn’t know there was a difference between sweet potatoes and yams. This sounds lovely! Cathy I think of you all the time as I have watched you for years go about living your dreams. All the work and labor you have done has been tremendous, but you are right, it is so worth it! Hi Cathy! Happy Fall! Love the dipping sauce you came up with. Believe it or not, I just tried sweet potato fries for the first time like a month ago and I LOVED them, now I have a deluxe sauce to go with. Hi Cathy – love your site and recipes. I live in central NY and have never heard of or seen “Fry sauce”. What the heck is it?! 🙂 (and what would the substitute be?) Thank you for the many times you have inspired me to try something new. 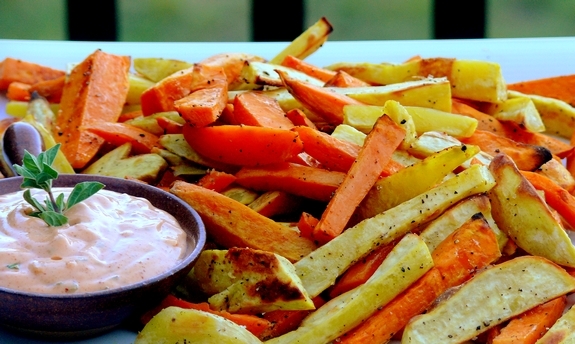 Fry sauce is a bottled sauce served with French Fries in, it has been around for a while now. Check the condiment aisle, there are several brands. In a pinch, it’s probably 2 parts mayo, 1 part Ketchup…but their would be other flavorings or seasonings added in. Almost like a Thousand Island dressing. Thank you for the substitution, Cathy. So funny how some products are a strictly regional thing. Checked locally, and asked around but “Fry sauce” is not known around here. So sad for us. My brother-in-law spotted it while traveling in Utah and was so enamored by the thought of it that he thought it could actually justify a relocation. This sounds yummy. Giz and I are menu planning for Canadian Thanksgiving (this weekend) — I’m going to send this one to her.